For tapping to be successful we need to tune into the issue at hand. There are many tools and techniques to do this. In this interview I talk to Andy Bryce about how we can use making sounds as a way of tuning into issues and emotions. By using sounds we can find ways to describe emotions as well as tune into emotions without having to go point by point through the entire issue, which can at time be painful. This is a very simple approach and an easy tool to add to your tapping tool box. About Andy: Andy Bryce has been working with personal growth, wellbeing and emotional resilience for over thirty years. For the last seventeen years, his primary toolkit has been Emotional Freedom Techniques. 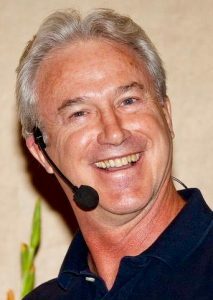 In 2006, Andy was certified as one of only 30 EFT Master Practitioners worldwide. Andy is also a certified mBraining Coach and P.E.T. practitioner. Andy is a past Director of Training for AAMET, and has trained EFT practitioners in Belgium, France, Canada, USA, Mexico, Australia, Italy, Greece, South Africa and the UK as a Trainer of Trainers. Thanks for this interview. I have done a lot of work with the voice and it was good to hear what an experienced EFT practionner has been doing with sounds. I have forwarded this issue of your newsletter to a friend of mine, Barclay MacMillan, Ph.D., who is a voice expert and teacher and who might be interested in this topic and its potential applications to his own work.